This absolutely fantastic novel has me sold on the stories Cleopatra, Octavian, Augustus, Caesar.. all those Egyptian and Roman historical names I'd not given much credence to before since 6th grade. 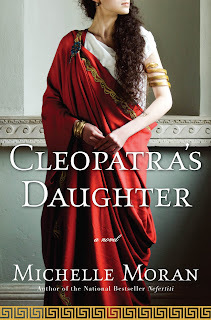 Michelle Moran has given a voice to Cleopatra's surviving children in a mesmerizing fashion through this third enticing novel from Michelle. Over 2000 years later, Cleopatra and her children are now fascinating readers everywhere with this newest novel that is expertly written by Michelle Moran. The setting begins in Egypt and travels with the children of Cleopatra to Rome. Cleopatra and her husband Marc Antony have lost their grip on their kingdom of Egypt, and their loss at war brings almost certain death to their children. The story begins when Cleopatra and Marc Antony die in a sorrowful way similar to the Romeo & Juliet fashion. All that was left of the prosperity that was once enjoyed and taken for granted was the love between the remaining children, who were suddenly orphaned within a day. We meet the twins at age 10, Selene and Alexander and their sweet younger brother Ptolemy. It is through Selene's words that we experience her uncertain world in this book and it is a journey complete with themes of family bonds, slavery, young love, the suffering of a child who has lost a future along with her parents, and the struggle to maintain one's beliefs within a different society. The fate of Selene and her brothers rests with the single man who has destroyed everything dear to them. The narrative through Selene is mature but believable; sad, yet invigorating for the suspense of the story. Every moment is glazed with the fact that Selene does not know when she will be executed. We are treated to the views that Selene experiences as she enters Rome for the first time as she and her brother are assimilated to an otherwise unknown culture. Michelle cleverly adds depth to the story by deftly explaining the ways of the Romans, as it is experienced first-hand by Selene. The imagery is created beautifully so that we can fully understand the surroundings, from the bathing chamber to watching the races, and the populated town of Rome and its people. The storyline moved swiftly as this is the epitome of a page turner. There are intriguing characters such as the new conqueror, Octavian, his wife, his sister, the many family members, his soldiers, members of the senate.. many characters that solidify Michelle's knowledge of the time period of around 29 BC. To be able to bring these otherwise elusive characters to life in such the intriguing way that Michelle has done proves that this author is not one to be missed. There are specific events that added intrigue to the novel and held suspense and raw emotion. The predicaments of the many slaves, the plebeians and the patricians are blended throughout the novel as Selene learns the customs of Rome for which she disapproves of. Selene is not an ordinary princess, or domina as she is sometimes called. In Rome, royal children were bred mainly for advantageous marriages, but the Egyptian daughter of Cleopatra was educated in languages, geometry and architecture, to name a few. Being so intelligent, Selene was allowed to study under Caesar's architect which was a rare thing for a female to be allowed to do. Selene began to study under Vitruvius and through this teaching we were subject to also be educated on both the Egyptian and Roman style of architecture and the materials used. The writing flows easily even when there are so many words that I did not understand because they are Roman and used in the ancient world, and normally that turns me off. But the author's style is so thorough and flawless that I breezed through it with an acute understanding. Also included are a characters list, time line, glossary, afterword and the author's historical note which are always helpful. I also try to balance out my reviews with some sort of criticism to make it look like I was paying attention, but I simply cannot think of one except that I didn't want it to end. Oh okay, one criticism is that the book trailer makes it look like it is primarily a love story... and that it is not. Of course it is an undercurrent, but that's not all it is. If this was indeed a movie, I would drag my husband out to see it! This is a wonderful story that gives a voice to an otherwise unknown Cleopatra's daughter, who was once the sun and moon of Egypt, and it is masterfully told. I would definitely recommend this throughout the historical fiction and even young adult genres. This is something that would work well for a history class and a book club as well. There is so much more to be told behind the main characters of Michelle's book, and I will just have to google away in order to quench my thirst for more. Thank you to Wonders and Marvels for providing me with this review copy. Please check back next week for your chance to win a SIGNED HARDCOVER edition of Cleopatra's Daughter, and also the new paperback release of Michelle's The Heretic Queen.